Working to make it Work! 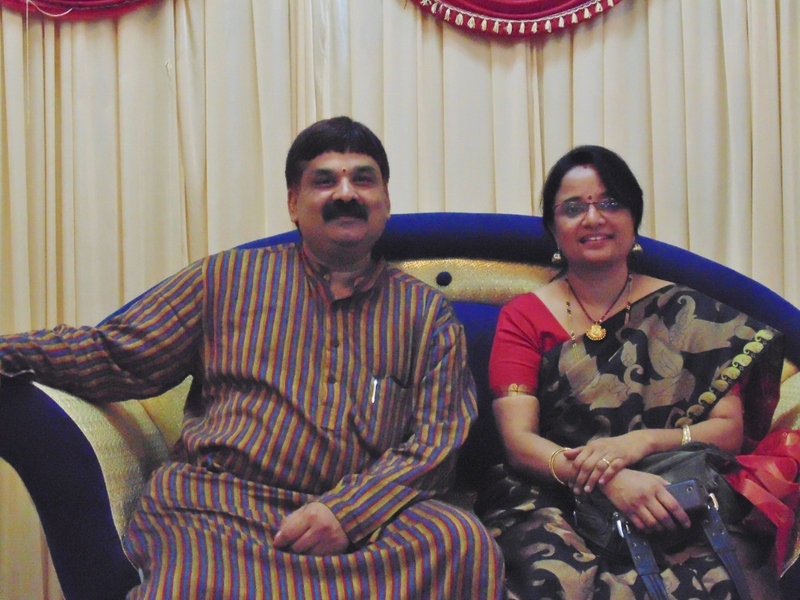 As we complete 26 years of this blissful journey of togetherness – a journey that we began as 23 year olds, with joy in our heart and hopes in our minds, someone asked me why I write (by now the customary) blogs acknowledging her gracious (for me grateful) presence. I have so many reasons to do that. Firstly, I got to acknowledge that she deserves much more than whatever even the best of my words and language that I possess can ever express and secondly, considering the alternative – a Card – Sorry! that would be a pathetic replacement to what I want to really say (also there is not enough space on it to write these or for photographs). This is also done to let the world know that this journey is possible even in these days. Finally, I also write to remind some folks who would have forgotten that it is a special day for us, to wish and bless us to continue this journey into eternity. “Only spiritual elevation can take away loneliness, not soul mates” said, Founder of Art of Living and our Gurudev Sri Sri Ravi Shankar ji. Yet He blessed us all along to make it easy for me to elevate myself spiritually taking away my loneliness but also ensured that soul mate made it even more easier. Those who know us would congratulate me, but they would agree and credit Aparna for this wonderful journey – that could well be an example of what & how it is supposed to be – Woman who is fixed, robust and capable of restoring any fallen ones around her. Someone who with lot of sacrifice, unknown to all of us, ensured that “Life is a celebration” not just for the immediately family but to the extended family (Let me assure you that it is definitely not a small one). This was evident just 2 days ago, on the Ugadi day – Painstakingly prepared fares, everything home made with a touch of love (that can never come when eating out) – egging us to do this or do that to ensure that guests simply feel WOW and want more! This has been the feature everyday of the 26 years that Aparna has embellished my life. I am sure children wouldn’t disagree that life, without her constant but extremely caring and loving nagging, would never been the same. How much ever they are grown, they are still the 1-5 year olds in her eyes and thoughts. Without being overbearing, her care is simply overpowering. Same with her colleagues at work. I am yet to hear someone saying anything “not good” about this wonderful soul, who took up the huge challenge to live with me for 26 long years, bearing all my idiosyncracies (especially when it comes to food) and still working to continue this journey into eternity. 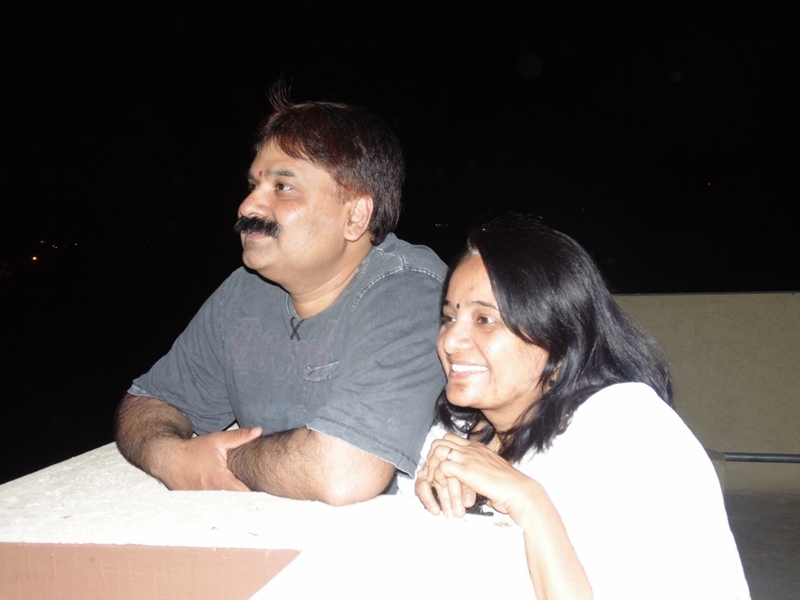 Then we have the extended family – Sindhu, Swathi, Iti, Asha, Meghana, Arun, Raghu, Yathin, Vidya, Giri, Binoy, Nagesh, Leela, Parinith, Rijina and this list goes on… who also bear the brunt of her love and care. A few months later in a contemplative mood, she asked how is it that our relationship of absolute opposite working – we only looked at each other, grinned and then picked up another argument to keep this relationship firing. It got to be a miracle. Did we believe in miracle? No! 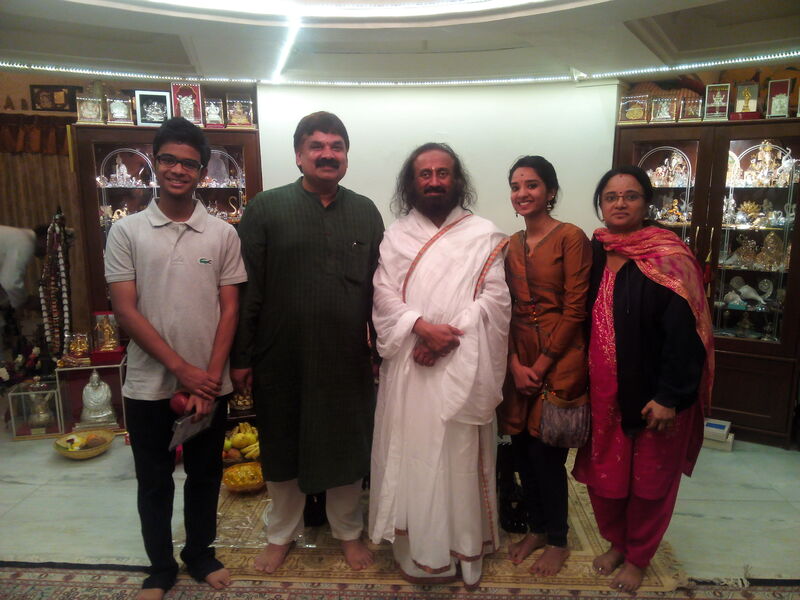 We don’t just believe, we rely on it (as Sri Sri spoke during one of His discourse). Our journey is a living example. And I would be claiming false credit if I say it is because of me. Thanks my Dear! For making all those philosophy work in our case. Given another chance to live my life over again, I only wish I would find Aparna sooner, so that I could live with her even longer. Hey Kali! Happy Anniversary to us! Dearest Aparna, When I tell you you mean a lot I don’t say it out of habit. I say it to remind you that you are the best thing that has ever happened to me. As some wise man said, Love is not gazing into each other’s eyes but both looking out in the same direction – I have to agree that defines what we both are to each other. When we keep hearing marriages and relationships breaking down, we always wondered if that is an option at all in the world. Where a year of wedded bliss is considered a humongous achievement, four over a score seem century to many. And reasons for that travels and rests squarely at your door. While many congratulate me on our anniversary, they always credit you Aparna (rightly so) for it. Why you? As the saying goes MEN ULTIMATELY fall in love with those women who bring out their best qualities and yeah you did that commendably indeed, for me to think beyond you. With the benefit of hindsight, I took a great call considering the grit and determination you displayed, the shoulder of support you lent that made this journey looks so easy. Being of extremely opposite nature where I sometime suspected your inability to express as sign of detachment, and on the other extreme, me a motor mouth and overtly expressing types – We just went on to prove that Opposites Attract. And the biggest gift – the two lovelies that we begot. What better blessings could anyone imaginably ask for? Jewels that Divya and Vishnu are, adorn the crown of our lives. I have to agree and be thankful to the Divine that took after their mother. Those bed time stories – even when you weren’t keeping very well – the values that you instilled in them, constant bugging and egging them towards perfection; I am sure I would have failed miserably on all the counts there. Thanks for being a great Mother too. Ever grateful to Pujya Gurudev Sri Sri Ravi Shankar whose blessings made every mountain that we encountered looked like a grain of sand. Thank you Dearest Gurudev for giving us the strength and wisdom to look beyond the obvious and ensuring a smooth sailing even on the roughest seas. Jai Gurudev!!! Finally! You have come a long long way from the cook who asked if Pressure Cooking rice needs water. Foodies that you are surrounded with acknowledge that today you give Sanjeev Kapoor a run for his money. Thanks for being you, Grateful for being in our lives. May we travel in this blissful journey for eternity. Loads of Love to the one who defined Love by her deed.